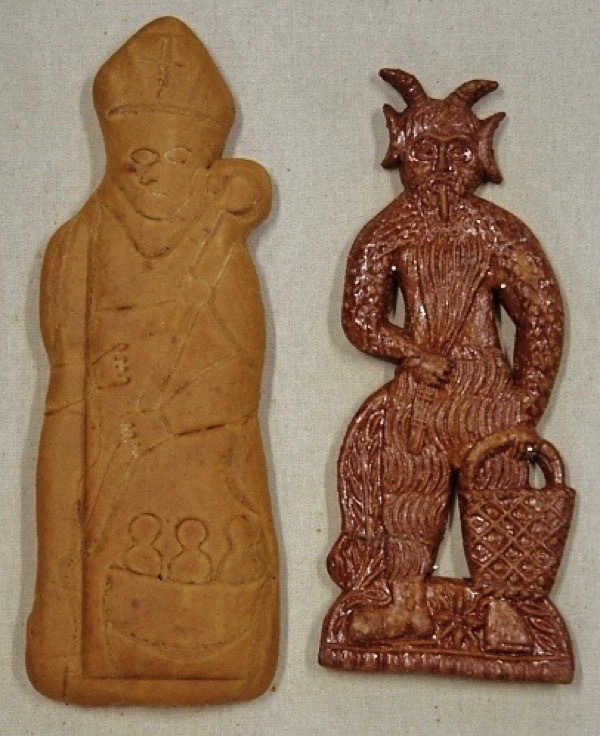 Many years ago, I bought a gingerbread figure of St Nicholas in a bakery in Galway. 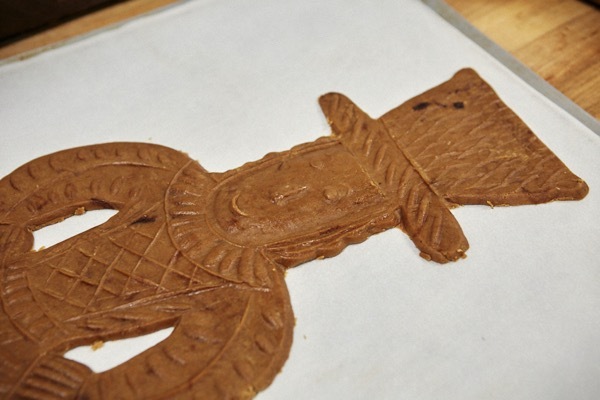 A few years later, I bought another gingerbread figure – this time of Krampus – in Prague. While St Nicholas brings gifts to good children each December, Krampus punishes those who have misbehaved, so I realised that my gingerbread figures belonged together. And all this time, they have lived side by side in a glass case on my bookshelf. 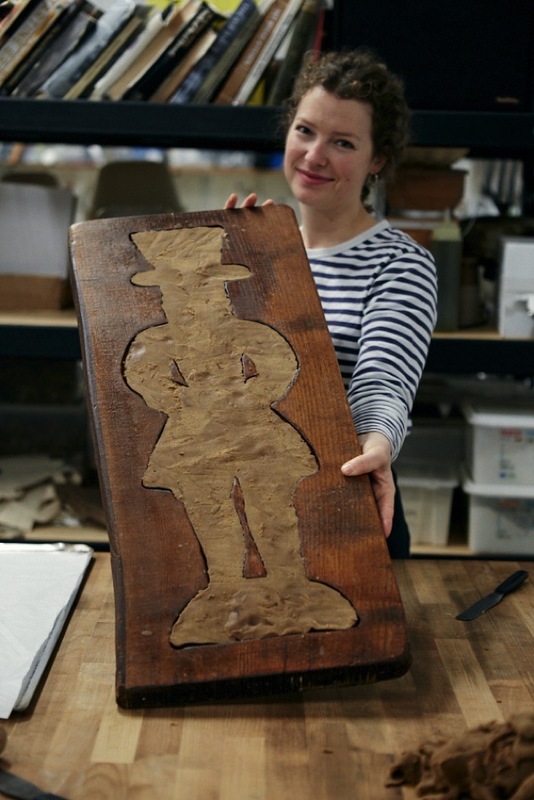 Imagine my excitement when Fiona Atkins, antique dealer and proprietor of Townhouse in Fournier St, showed me a hefty old wooden mould for a gingerbread man she had bought in an auction. The design was of a man in Tudor clothing, not unlike the outfits worn by the yeoman warders at the Tower of London, and the figure was over two and a half feet high. He wore a wide-brimmed hat, a ruff and long quilted coat with slashed sleeves. 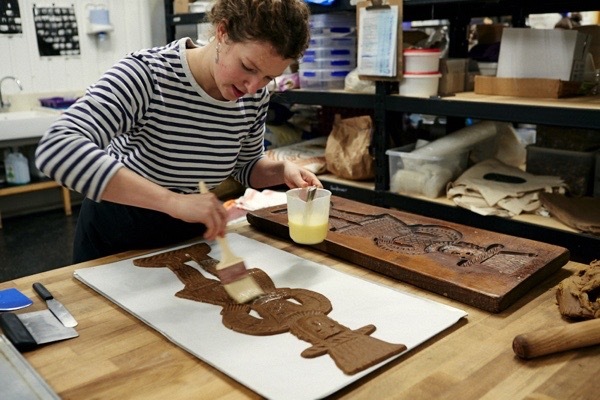 At once, I persuaded Fiona to let me find a baker to make us some giant gingerbread men. 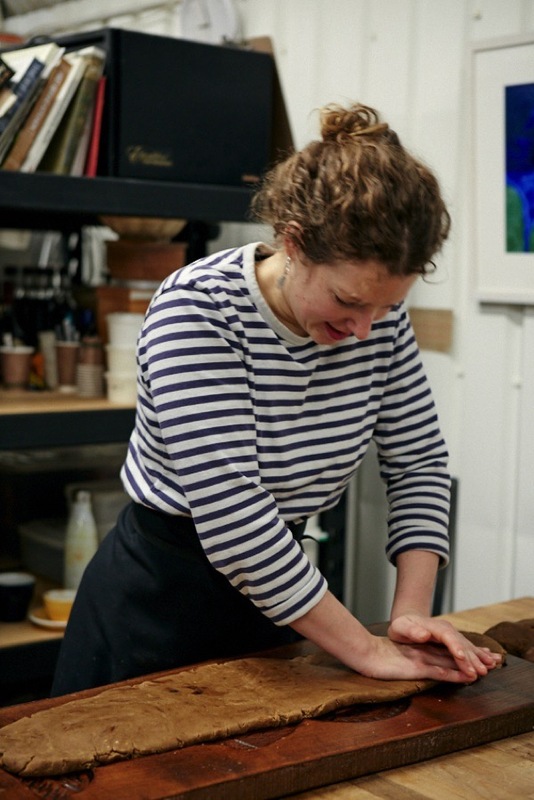 My good fortune was to meet Louise Lateur, a pastry chef from Flanders working at E5 Bakehouse, who agreed to take on the challenge. 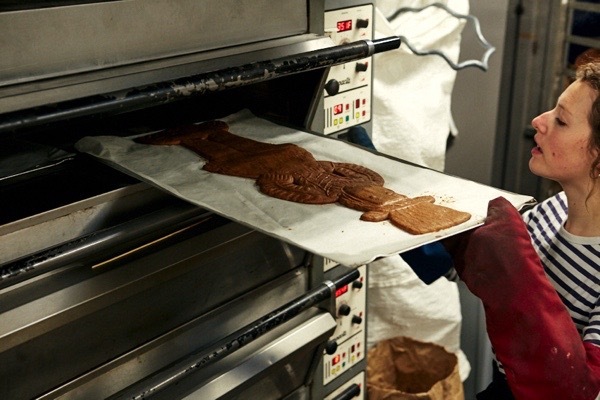 Thus it was that, early one frosty morning this week, Contributing Photographer Patricia Niven & I arrived at the Bakehouse under the arches in London Fields to record the baking of London’s largest gingerbread man. 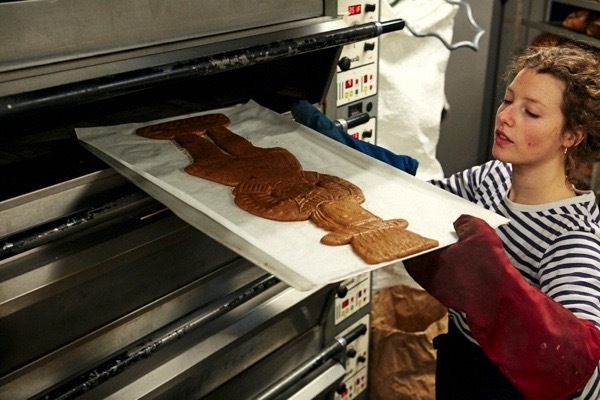 As a Belgian baker, Louise knew that the correct name for these gingerbread figures was ‘speculaas’ and recognised the design of the mould as one of St Nicholas’ helpers. Her father had a similar mould hanging on the wall at home in Ghent and she knew the traditional recipe. 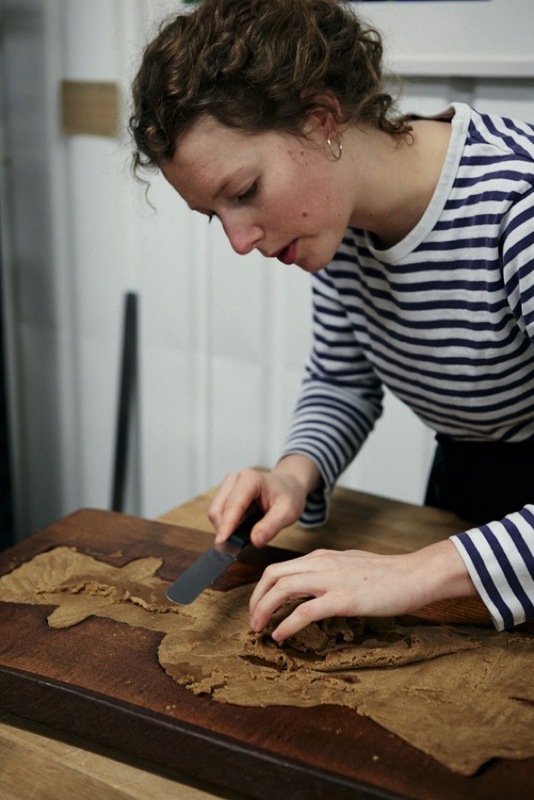 “At pastry school in Belgium, it is one of the things you have to make to qualify,” Louise revealed proudly. 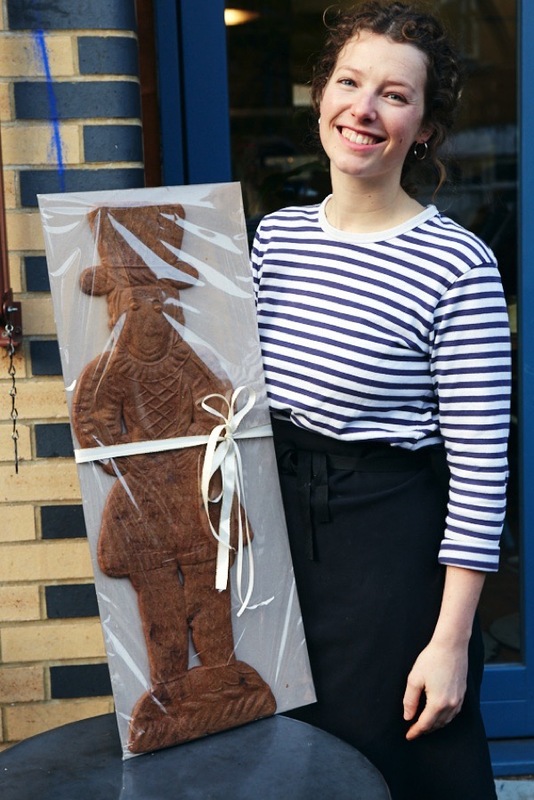 Yet although Louise has made speculaas, she has never made one of this size before. 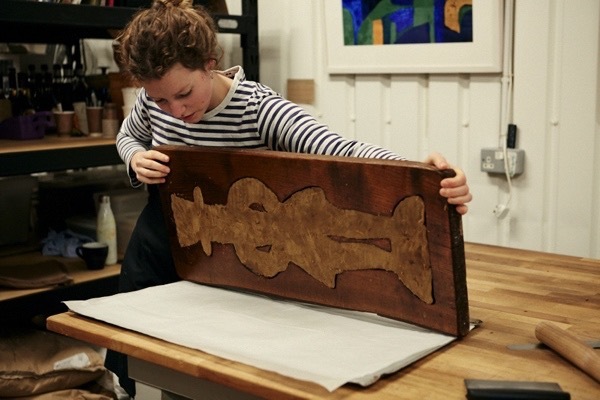 Taking out a large lump of the golden dough, Louise rolled it on the table and then placed it on top of the mould, pressing and spreading it out to fill the figure. The density of the dough rendered this an arduous task, demanding twenty minutes of pushing and pummelling, requiring skill and muscle in equal degree. 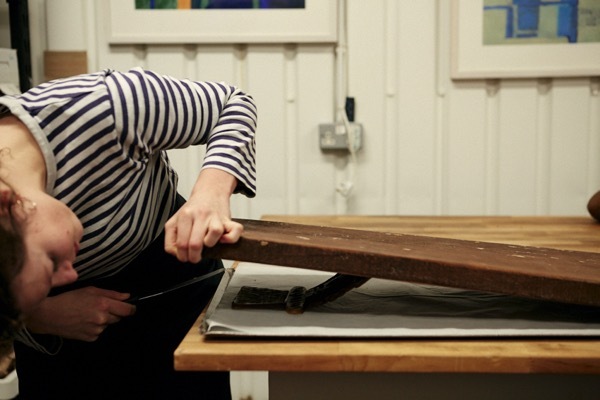 As she worked, Louise trimmed the excess from the back of the mould with a flat knife and added it to the bulk of the dough as it extended to fill the mould. 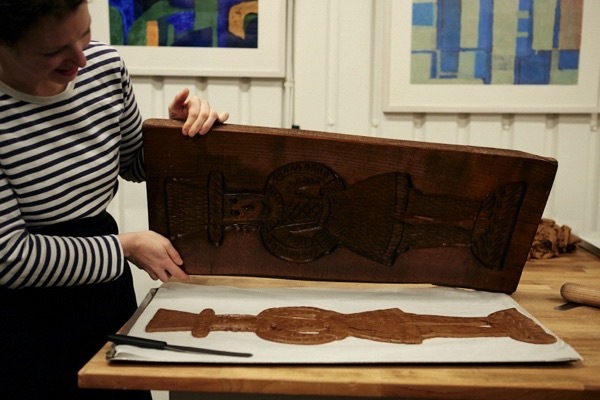 Once the mould was full and the edges of the dough neatly trimmed, Louise faced the challenge of turning the gingerbread man out in one piece. Tilting the mould sideways, she stood it up on its longest side and then quickly turned it face down onto a sheet of greaseproof paper. Lifting one end carefully, she used her flat knife to coax the edge of the dough from the mould. We held our breaths. Suddenly the head fell out and, as Louise lifted the mould away, the entire figure rolled down onto the greaseproof paper in a single wave. He did not break and the impression of the mould was perfect in every detail. What had seconds before been mere dough suddenly acquired presence and personality. 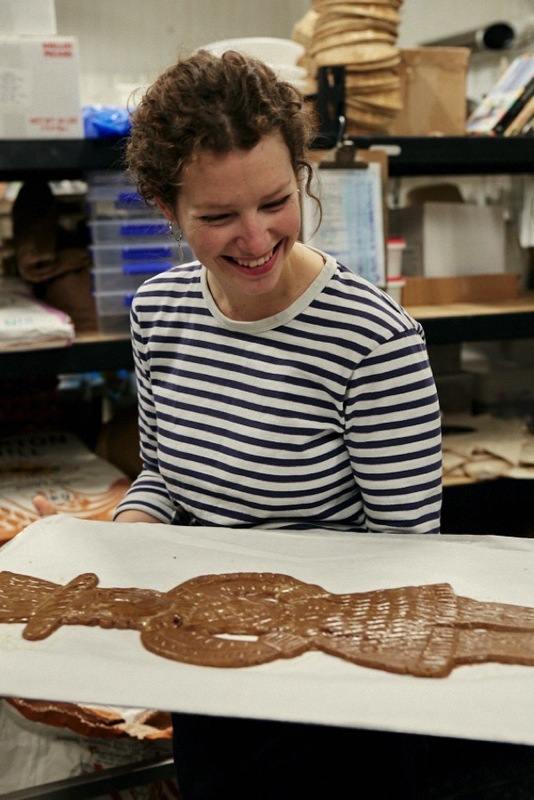 Behold, London’s largest gingerbread man was born. We stood amazed and delighted at this new wonder of creation. Exhilarated and relieved, Louise painted the figure with egg white to give it a shine and a crust when baked. Meanwhile the gingerbread man lay inert, regarding us with a vacant grin. After another twenty minutes, he emerged from the oven as shiny-cheeked as a footballer from a tanning salon. Glowing with delight, we stood together and admired our festive bakery miracle. Could this be the birth of a new Christmas tradition in London Fields? Wonderful, fascinating, and full of fantasy! Also, the baker has such a fascinating, lovely face, especially with the interesting hairline. Beauty all around! GA, delightful story! So many memories of gingermen past from childhood. Glad he turned out so well! Have you thought about the consequences of biting into St Nicolas , specially for your teeth? Yes it’s a good thing you have Krampus there to watch over his misdeed of offering you temptation . That old Gallway fellow should have allowed himself to be eaten years ago ! Very impressed that at your first attempt all the dough come out in one go. That’s the advantage of using an ‘older’ mould that has been used many times and has been well oiled years ago, or more recently. Happy speculaas spice baking times ahead! I assume Louise oiled the mould, correct? Stand back — Let me through! 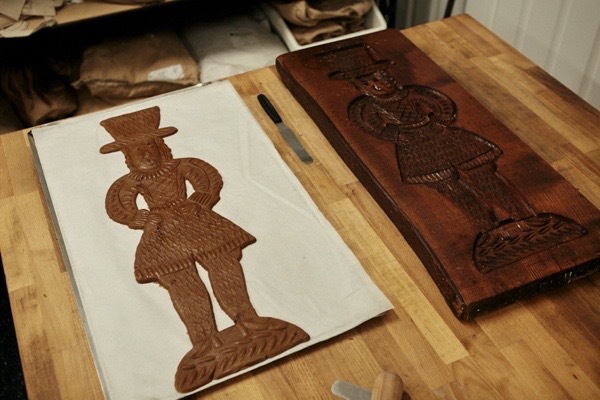 I am pushing my way past the security lines, and hopping a plane so I can have one of those ginger men. Nah — I’m just here, still in my jammies. But I thoroughly appreciate everything about the story and would give anything to be in your wonderful town right now, buying up cookies for everyone I know. I love the baronial size of the cookie — a real statement, methinks. 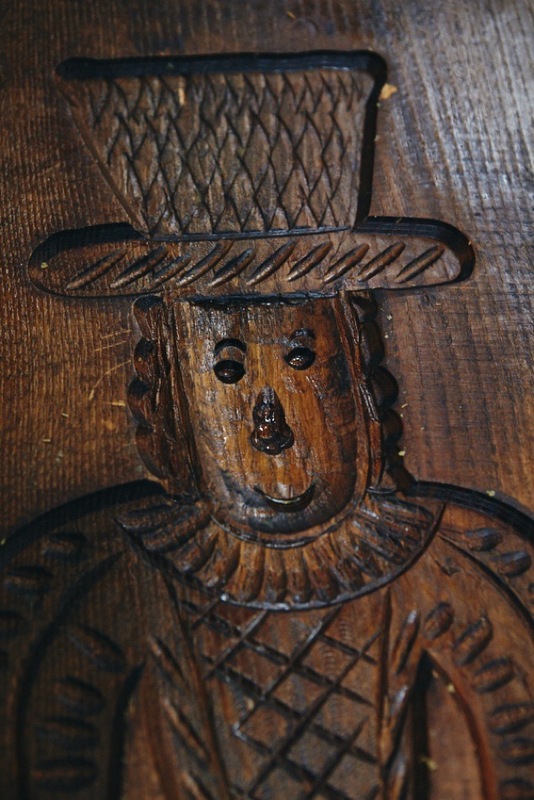 And, wow, that wooden mould is so handsome — Makes me wish there was a ginger LADY to go along with. Bravo! What a magnificent ginger man! I read somewhere (not so recently, since I can’t cite the source) that here in New England in the 16th and early 17th centuries ginger men were forbidden because they were “graven images.” Our Puritan forefathers were no fun at all! They refused to “celebrate” Christmas as well. The “observed” it. Not the same thing. Does anyone have tips for stopping the dough sticking to the mould? I have a small St Nic mould, about 6″ high carved from pine. I bought some years ago in Germany, but I’ve not yet used it. My great nephew Rupey (aged 4) will be interested in this! He has been busy making (and eating) lots of ginger bread recently but nothing of this scale… it looks amazing, and the figures are full of character. Great baking! I agree with Saba. 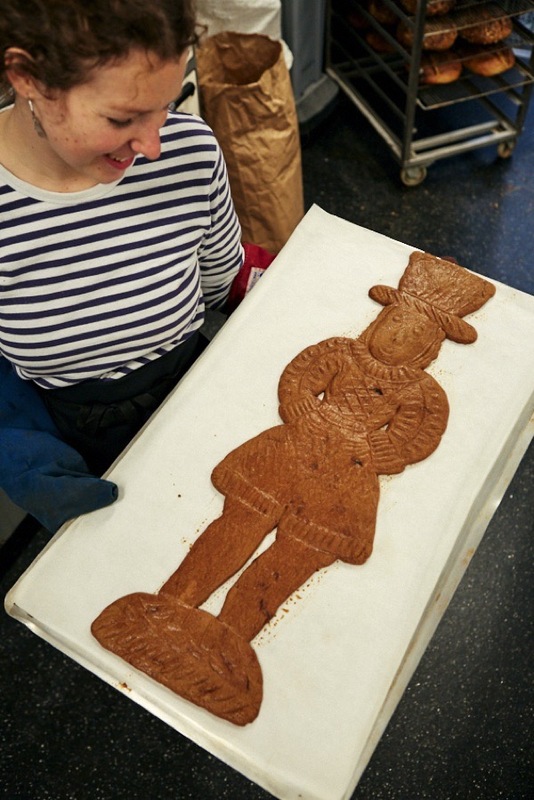 A large & handsome Gingerbread Man and such a lovely baker. I am entranced with her and that warm beautiful smile that has lifted my spirits. Thank You. I expect these delicious figures would have been commonplace in times gone by around the ‘little Germany’ area of Spitalfields with it’s many bakeries? Wonderful Christmas season piece. Well done Louise, and I love the Krampus-he looks bad! I have one of these molds (er, moulds) hanging in my kitchen. It was something my mom collected years ago, but I never knew exactly what it was. Alas, I don’t think my oven is big enough for a ginger man of that size — but thanks for the education!